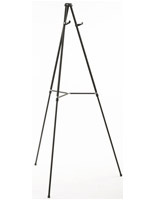 This Aluminum Easel is one of Many Useful Display Stands Available! Pick from Floor-Standing, Table Top, and Combination Models! 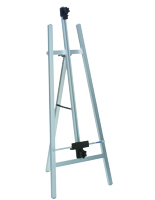 This Aluminum Easel Features Four Feet for Additional Stability! 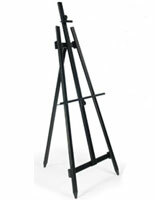 This black aluminum easel is a versatile, artist stand that is great for indoor, outdoor, and tabletop use. 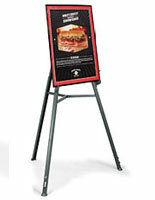 Constructed with a unique, four-leg design, this display stand is lightweight, yet built to last. 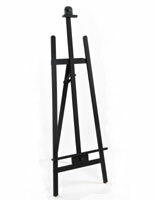 Each aluminum easel features adjustable, telescoping legs and a top clamp designed to hold a variety of different sized materials. 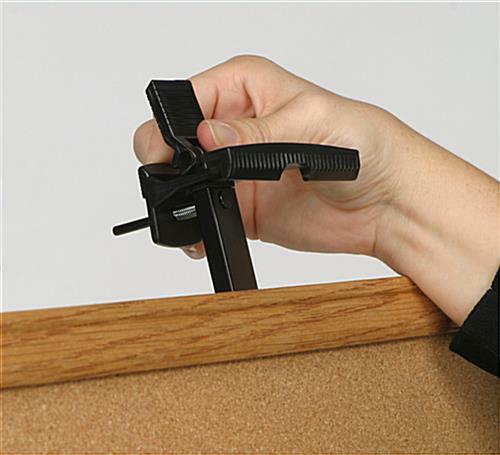 Use this stand to display poster frames, bulletin boards, dry erase boards and more. 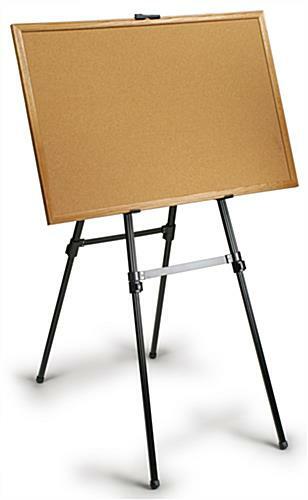 A presentation display like this aluminum easel is perfect for use in classrooms, art studios, lobbies, sales presentations, and anywhere else you can think of! 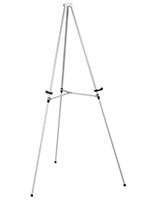 This stand features an extremely versatile design that you will not find in other comparable units. 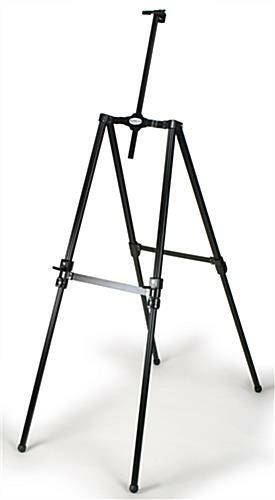 Unlike display tripods with just three legs, this aluminum easel has four, giving it a more sturdy structure. 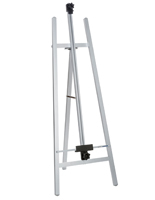 Each leg features a telescoping design with locking levers, so that you can select the appropriate height for your display. 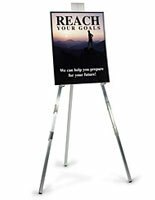 This presentation stand can be compact enough to fit on tabletops or can reach a maximum height of about 5-1/2 ft tall. 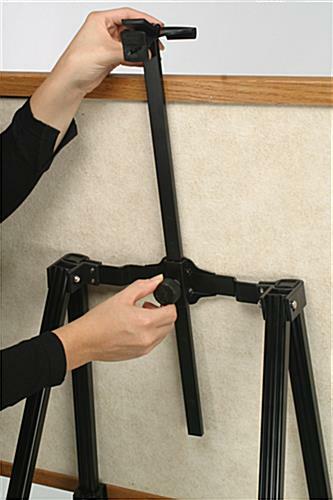 This aluminum easel also features adjustable support arms that slide up and down along the front legs to accommodate different sized displays. These movable supports hold boards up to 39-3/4"h, and allow users to position smaller items at different heights along the stand. 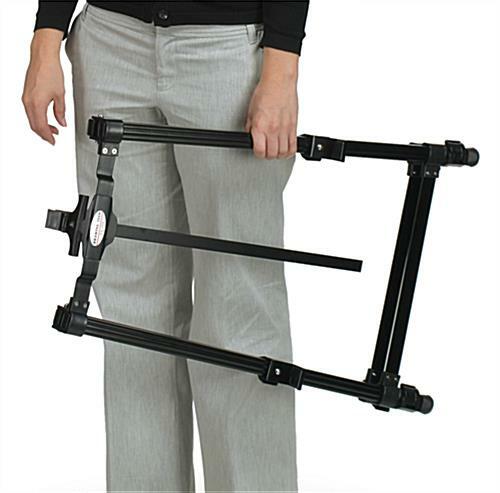 Designed for ease of use and portability in mind, this folding stand conveniently downsizes for easy storage and transport. 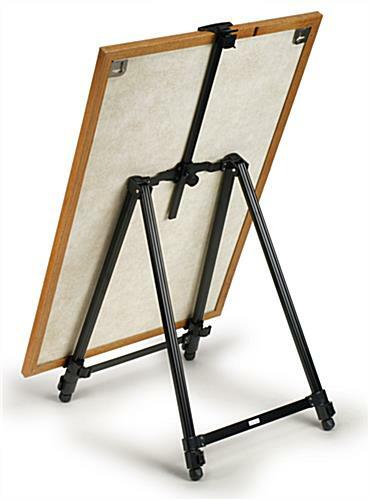 In its most compact position, this aluminum easel is only 27" x 18" and weighs less than 5lbs. As such a portable presentation display, this fixture is perfect for traveling salespeople, teachers, and trade show attendees. 20.5" x 67.0" x 24.0"